It’s official. Sallycat‘s fabulous Happy Tango guide book has been seen in the wild. My copy ordered from amazon.co.uk hasn’t been delivered yet, and even when it is, I won’t actually get my hands on it until at least October. So how do I know it’s fabulous? Because I was privileged to be one of the beta readers back in December 2009 and I have been living my Buenos Aires dream for the last 3 months based largely on what I learned from the book, and before that from Sallycat’s blog. 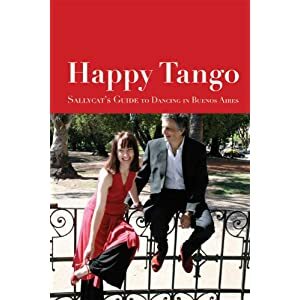 If you’re thi nking about coming to Buenos Aires to tango, or if you’ve already booked your tickets, be sure to get a copy of Happy Tango before you leave for the airport. The sooner you get one the better. Already got a Lonely Planet or other guide book? Don’t have room in your case for a second? Chuck the one you’ve already got and bring Happy Tango instead. It really is that good. This entry was posted on Friday, July 16th, 2010 at 00:33 and is filed under Main. You can follow any responses to this entry through the RSS 2.0 feed. You can leave a response, or trackback from your own site.